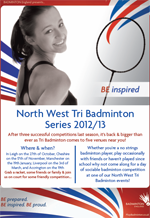 The North West Tri Badminton Series is back this year, with two additional dates and venues! The series consists of 5 tournaments that run throughout the year with each being at a different venue. The tournaments are for social players who are looking to compete with similar players from all over the North West. So if you go to a No Strings session, just play with friends or are new to the sport, why not sign up for a day of sociable badminton? For more information and to enter, please contact Vicki Maltby.